The Campbell River Bike Park Society is a not-for profit Society whose primary mandate is to develop and maintain a mountain bike skills at the Campbell River Sportsplex. Mountain bike skills parks allow riders a safe environment to learn and practice bike handling skills before heading out into the trails. Campbell River and the Comox Valley are home to some of the best mountain biking trails in BC, and are a major tourist destination for mountain bike enthusiasts. Since its inception three years ago, the Society has focused on securing land for the park. This year city approval was granted to build the bike park at the Sportsplex, between the two entrances on South Alder street. The Society, in partnership with the Campbell River Department of Recreation, also runs the Sprockids program for youth ages 4-13. This program is extremely popular and has sold out within the first hour of registration each year. The Bikepark would become the primary tool for teaching the Sprockids program; a significant improvement over the gravel field we are currently using. 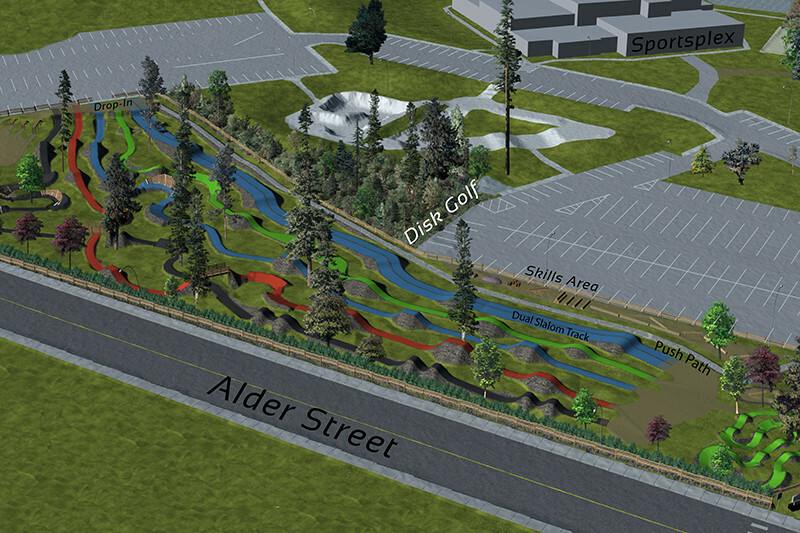 The project plan is to develop the bike park in a phased approach with a separate budget for each phase. The budgets assume that the Society will pay for all of the elements required to complete the phase. This amount may decrease should we receive donations of materials and/or labour. The Society is recommending developing the park in three phases. o Phase 1 includes a pump track, a small outbuilding, and plumbing for running water to the site; the budget for this phase is $40-50,000. o Phase 2 includes a picnic area, a tot zone, and a small-stunts practice area; the budget for this phase is $20-25,000. o Phase 3 includes four groomed lines with small walls, jumps and bridges; the budget for this phase is $125-200,000. To date we have raised $19,000. Our goal is to raise an additional $50,000 by October 31, 2017 so that we can commence the construction of Phases 1 and 2. We are asking you to sponsor this highly anticipated recreational facility either through direct monetary sponsorship or with work or supplies in kind. Although a monetary donation is most useful to the Society, we could also use donated fill, machine time, concrete, landscaping services and trees/shrubs and carpentry work so if you want to help out but don’t have money to donate please talk with us to work out an in kind donation. The CR Bike Park Society hopes that you consider supporting our project. We can provide you with further details and a full break down of the costs and requirements if you require. The Watkin family would love a bike park in CR! Hope to see it started soon! Hoping more share this and spread the word. Bike park for everyone from new to riding to experienced mountain slayers!